Been a long time yet again. Caldane morphed into a novel called The Archbishop’s Amulet and it was released in April of 2016. FountainCorp Security — Military Science Fiction using the same character as in Vile Money-Grubber, except Vile Money-Grubber is now called Once A Hero. The Devil’s Library — A Fantasy novel in the Windhaven Chronicles series. I’m writing the third book in the Diaries of a Space Marine series, tentatively titled HART (Hellas Advanced Recon: Tactical). I’ve got two fantasy novels waiting for revision: The Shepherd Girl’s Necklace and The Snow Tiger’s Trail. I’m still learning how to release and market the books. The Devil’s Library reached #2 in Kindle Fantasy (free), but it’s falling off the charts now that it’s on for Paid. 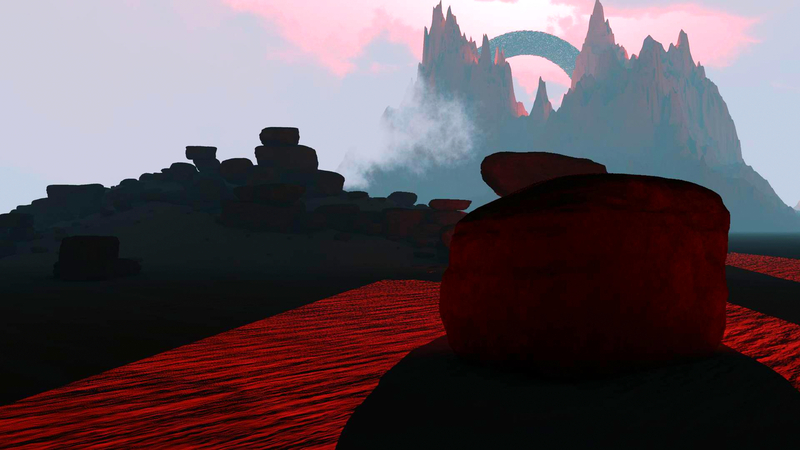 And I’m still doing the 3D Artwork thing. It is hilarious to read my plans from the last post. After getting Loathsome Tales out (buy it on Amazon)-you KNOW you want to buy it immediately-I started to work on Lord Gartan’s Book. But then I started thinking about it. I really wanted to do The Necromantrix, which is a story about Gartan getting to Windhaven, but losing the book to some local girl. And that local girl being turned into an evil force. This happens immediately after the end of Loathsome Tales. I started exploring my characters, trying to figure out who did what, why they did it, what I wanted to say with them, and I got enamored of the PREQUEL to that story, the story behind the motivations of a character that, at the time, I was calling Inare. 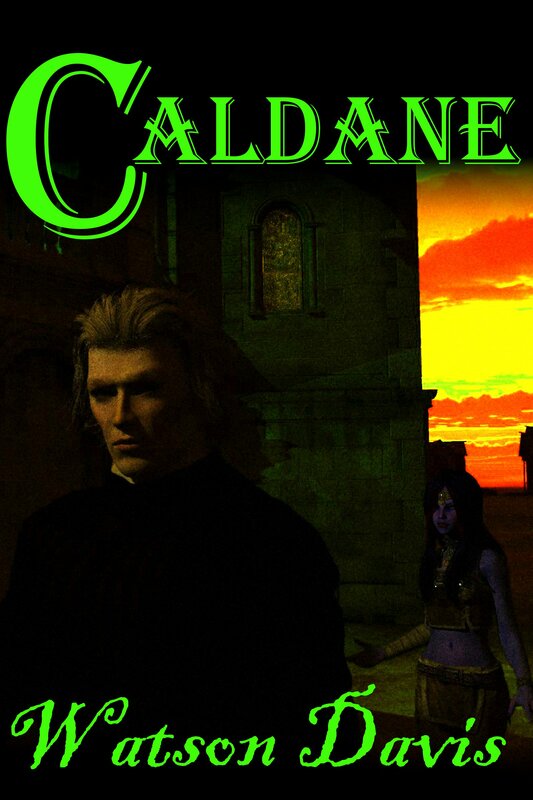 After fiddling with it a bit, though, I changed his name to Caldane. This is a Science Fiction novelette. This is the main character from my Macbeth Station story, but much earlier in her life. I learned a lot about her writing this story, and I lurv her. 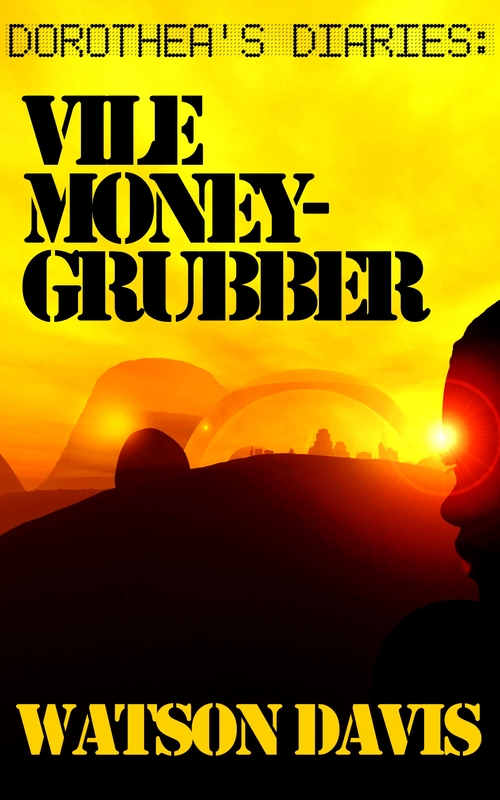 So I finished up Vile Money-Grubber, and got that beta-read and edited. And it’s on Amazon now. And now I’m back to working on Caldane. Instead of writing Ventus Fortuna, I went with Windhaven. I wrote almost 30,000 words from scratch of a book that had only partially been planned. Now… I’m waiting for a couple of beta readers to get back to me with their issues and I should have this thing out. For the next book, I’m going to do the Windhaven-world prequel to Gartan’s Book. Then I’m going to revise Gartan’s Book and get that out. 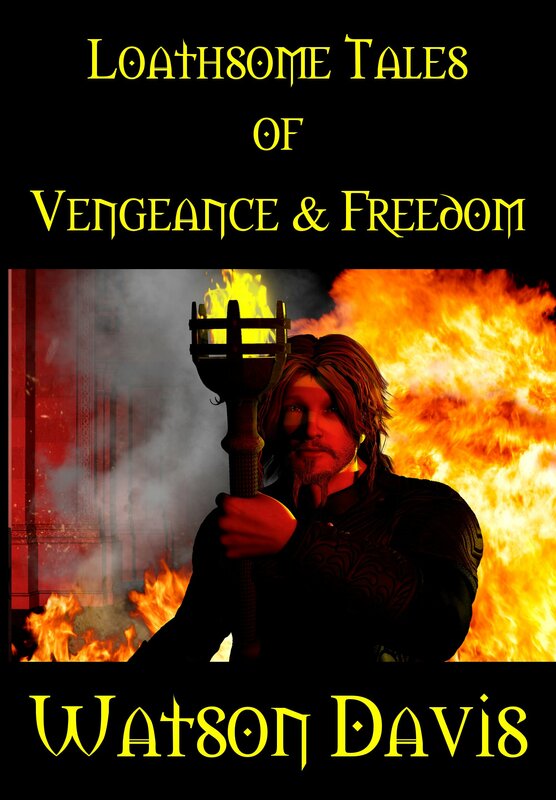 My plan is to release the Prequel in September and then Gartan’s Book in November. I want to put Ventus Fortuna off until I get some time to go through some classes on life in Republican Rome. The first set of stories I want to write for that are all set in that time period and I don’t want to mess up any of the actual historical facts of it. 1. Ventus Fortuna comes together when some Spartan refugees (who were going to Taranto to help found that Greek colony — actual historical thing) were blown off course (Fortunate Wind — Ventus Fortuna) and crashed on the Italian coast by the river Tifernus where there’s a small fishing village. This is Iron age stuff around 700-600 BC. This stories in this book will be about the clash of the Italic and the Greek cultures as well as the mystery of the Standing Stones and the creation of the Magic Pools. I’ll have Greek and Frentani characters. 2. The Samnite Wars: Ventus Fortuna is a Frentani port/fishing village and the Frentani are Samnites. The Samnites unite to fight against the Latins who are trying to take over. The Samnites enlist the aid of the Etruscans and the Gauls but they still get crushed in 3 different wars (these wars are Actual History). 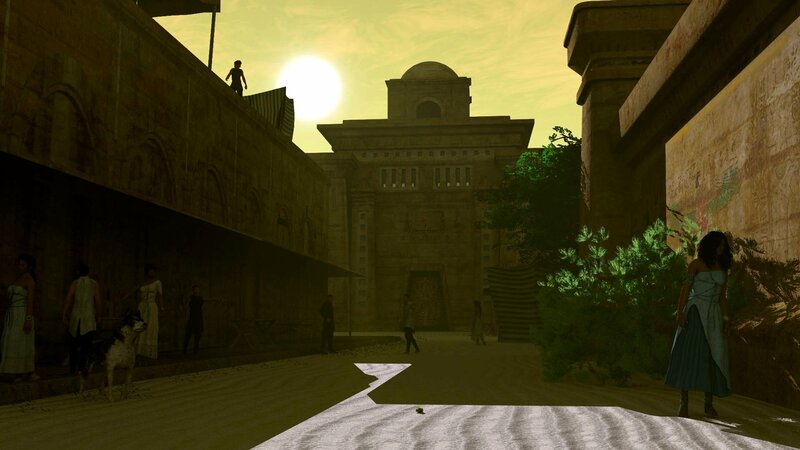 My stories will take place in the third of those wars and will feature Ventus Fortuna as a staging point for the Samnites prior to a big battle on the Tifernus (actual battle history). After the battle, the Romans will come in and sack Ventus Fortuna and pretty much obliterate it. 3. The Second Punic War: Unlike the rest of the Samnites, the Frentani supported Rome against Hannibal and Carthage. My character, Septimus Cloelius Seneca, will convince Rome to allow him to rebuild Ventus Fortuna as a major port on the Adriatic. (There is recent archaeological evidence that Termoli was a major port at the same place where I’d put Ventus Fortuna.) This leads to issues with the Samnites as well as Carthage. Seneca will deal with all of that (rebuilding the city, defending it, and leading it) while trying to deal with his 10 year old son, Spurius, who has been acting very strange since his wife’s brutal death on the horns of a bull. 4. The Battle of Zama: Spurius, now into his late teens, is tapped by a powerful Roman General, Scipio, to join the legion and become his “bodyguard” after Spurius uses his “gifts” and saves his life in Ventus Fortuna. Spurius handles the magical side of the Battle of Zama where Carthage was ended as a major power and the Roman General earns the name Africanus. Spurius, unfortunately, sacrifices himself and winds up in Hell. With his unborn brother protecting him. 5. The Return: Spurius hears of a plot against his father and fights his way out of Hell to help protect him. But then, he learns the real story behind his parentage and the reason why Venus, disguised as a bull, killed his mother and his unborn brother. And then there are the battles against Bacchus and the Persians and Spurius is again tapped by a Scipio to help. 6. The Fall of the Republic: Not sure what’s going to happen here but Julius, Pompey, Antony, and Cleopatra provide a great backdrop. I’ve also finished a couple of short stories that I had started prior to this. I’ve created a list of short stories that I’ve started in various workshops and my plan is to go through and write a little each day on these while I’m not technically writing on HTWAS. My goal with this blog is to use it for a semi-bi-weekly status report/update. I’ve got a “daily” status in the WABWM (Write A Book With Me) threads over on Holly’s site as well as a daily status/plan in a Scrivener project. I got my format for my daily status/plan from the daily status report I fill out for work. I write a brief blurb describing the previous day’s events: a header that says “Yesterday”, then a list of things I had planned to work on, what I actually did (if anything), and then things I hadn’t planned on working on, and what I actually did. Beneath that, I write down “Today”, a list of things I’m planning on doing broken down by project. This keeps me focused. I’ve tried several times to use the Outlook Task Manager in conjunction with a Priority field to put things into the sequence I want to work on them but I never seem to keep it current. But with this Daily Status, it’s just something I fill out pretty much as soon as I sit down at the computer each day. On work days, I fill out my work status and then my personal status. That way, it’s just a set routine. I just looked back at my previous entry and saw that I’d already mentioned my daily status. smh. Anyway, in the past couple of weeks, I have somehow re-found my writing groove. It has been pretty awesome. I love when this happens. From 5/12-5/16, I wrote 30495 words in Lord Gartan’s Book. I’m about 5-6 scenes away from The End. At which point, I’ll set it down, let it rest, and then take it through HTRYN and hope for the best. The book is going to end up around 50,000 words total. So the question is going to be what to write after that. I’d hoped that we’d be further along in the HTWAS-E (How To Write A Series – Expansion) class over at Holly’s so I’d be able to sit down and start writing more stories for my various series. But we’re not quite there, yet. I’m going to have to figure out what to work on next, whether to finish up some of the Fortuna short stories I’d started, whether to re-visit The Farmer’s Boy/Infernal Influences as the last book in the Windhaven series and finally put it through HTRYN, whether to begin work on FountainCorp, or go back to Macbeth Station. And then there’s The Queen of Balthazar. On a personal note, I think the bizarre flu thing that knocked Audrey and I out for all of April is finally gone. (Knock on Wood.) I was able to start lifting again this past week but I had to keep it very, very light: 225# squats, 135# bench presses, 115# power cleans. I’m playing with the idea of competing at the AAU Nationals in powerlifting this November. I haven’t competed since 2004 at the Worlds. Also, a thread on Holly’s site made me start to think about re-visiting the story that started it all, a comic book about an illegal, genetically-engineered shapeshifter in space, trying to live a normal life. I could maybe incorporate that into the FountainCorp universe. I created a test picture of the hero. Oh, and on that front, I’m debating whether to upgrade my 3D software. Right now, I mostly use Daz Studio (freeware) to create my characters, Hexagon (freeware) to model anything special I need, and Vue (decidedly not freeware) to do most of the rendering, especially the outdoor scenes which it is AWESOME at. The picture above was done in Daz with the stars added in GIMP (freeware.) I also have Carrara, which is not freeware, and it’s kind of a jack-of-all trades, master-of-none software. 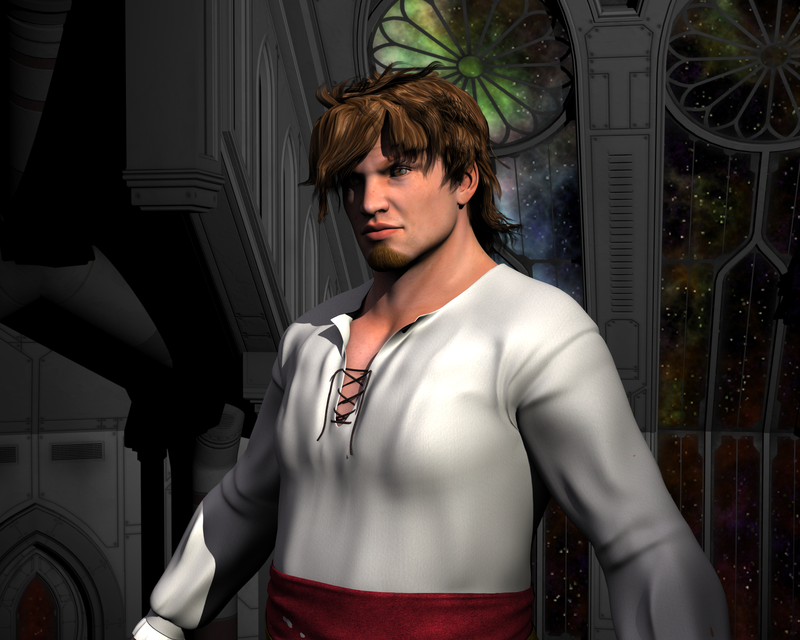 I’m considering whether to upgrade to Poser, which is like a better version of Daz, or Lightwave, which is a super-duper upgrade BUT I’d have to continue to create my characters in Daz and then import them into Lightwave. 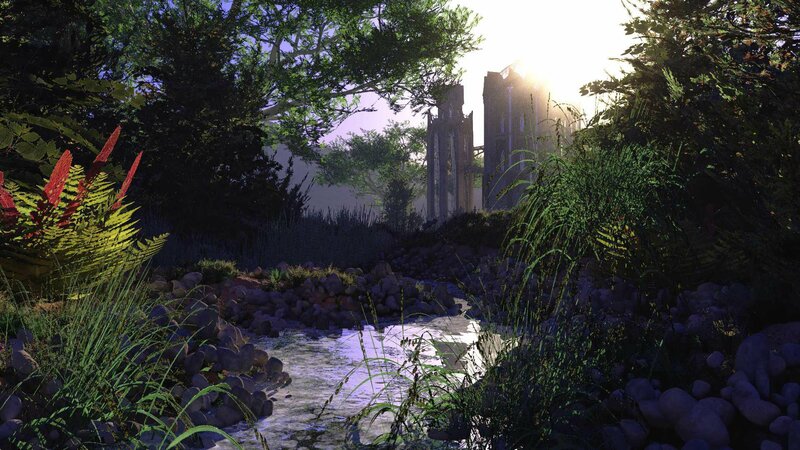 But Lightwave has some great features and it has a built-in modeler that’s better in many respects than Hexagon. It’s like an upgrade of Carrara. One of the reasons to go with Poser ($500) is that it has better links to Vue and it has “rooms” for creating cloth and clothing. OTOH, there’s is an AMAZING program called Marvelous Designer that is made specifically for making clothing. I’m dying to get that. I’ve just been going around and around in my head, wondering which one I’d get the most use out of and the most benefit from. But. I’ve got to keep myself from following the rabbit down that rabbit-hole and getting drawn away from actually writing. But looking at this blog, going back to the beginning, reading the things I was working on, how I was attacking them, well… it’s been eye-opening and disheartening. I’m still working on the same books. I’m rewriting Lord Gartan’s Book right now. From scratch. Again. The story is nothing like it was when I started this blog back in 2009. 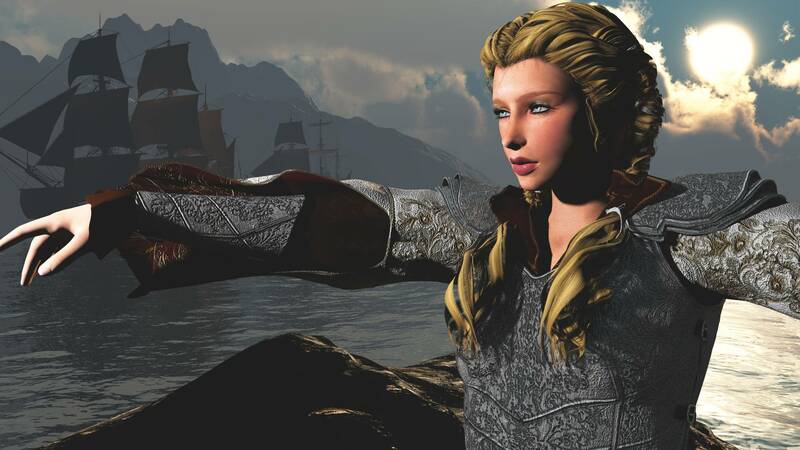 I’ve got The Queen of Balthazar on the backburner, waiting to be worked on. I feel like I’m a much better writer and a much better 3D artist. Nowadays, I have a Scrivener project called How To Write A Novel. In there, I have notes and ideas from various classes (Holly’s classes, lots of Savvy Author classes, various books by James Scott Bell, Todd Stone, etc. ), story ideas, step-by-step ways to come up with ideas for stories, how to plot them, how to create characters, how to write, how to revise. And I’ve also got a daily Status Report where I write down what I worked on from the previous day and what I’m planning on working on that day. And every day, I grab the list of things I planned to work on and write down what I did and then create the list for the next day based off of that. It keeps me focused a lot like this blog used to when I was trying to do the WABWM all alone after Holly abandoned that when she started getting migraines. I’ve discovered Coursera and I’m taking a ton of courses, which kinda eats into my writing time. And I’ve bought a few Great Courses videos: how to build sentences, life in Pompeii, ordinary life in ancient times, the history of languages, etc. But I’m learning a lot and I think it’s informing my writing. I’m going through Holly’s HTWAS-Expansion and after reading most of Write! Publish! Repeat!, I’ve mapped out several “funnels” using collections of short stories and novels and novellas and that fits in with what Holly’s trying to do with both the HTWAS-Expansion and her Ugly Baby courses. So hopefully, I’ll have something completely my own self-published before too long. Oh, and my wife is planning on us retiring to Spain. So there’s that. That seemed like fun. So while I work on my revision, I’m also creating a couple of languages. But. While creating the languages, I’ve already come up with a whole world and story-line. I’m still going to go through the workshops and flesh everything out but I’m pretty pleased with what I have so far. That’s Jiax (the Hero) and Yu’ya (the girl he wants to impress) and his horse. And a dragon. 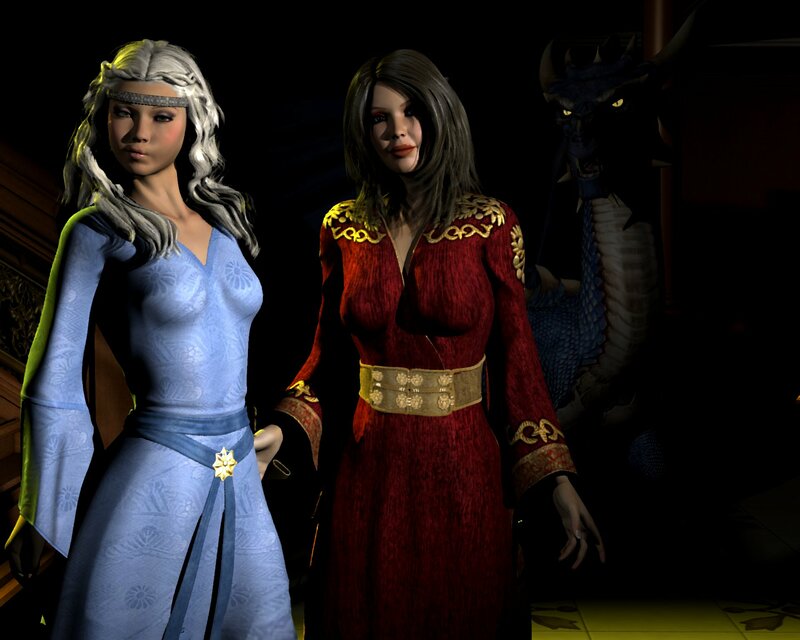 That’s Toukala (Jiax’s impact character), and a minor character… and a baby dragon.